WASHINGTON (MarketWatch) — The pace of construction started on new U.S. homes rose last month to cap the strongest year in seven, according to government data released Wednesday. 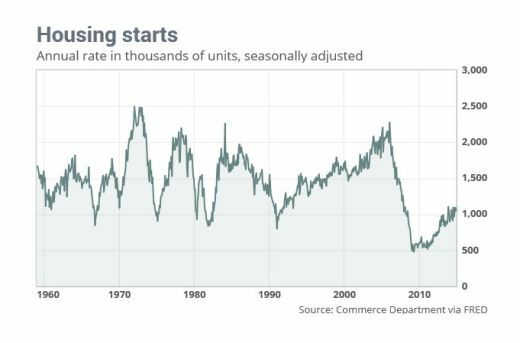 Housing starts rose 4.4% in December to an annual rate of 1.09 million, the U.S. Commerce Department reported. Starts of single-family homes hit the highest level since early 2008. Economists polled by MarketWatch had expected the government to report that the seasonally adjusted annualized rate of total housing starts inched up to 1.04 million in December from an originally reported 1.03 million in November. On Wednesday the government tweaked November’s starts rate to 1.04 million. “Demand for housing remains under pressure with Americans still struggling to accumulate enough wealth to afford a home purchase. With demand restrained, housing insiders remain cautious not to oversaturate the market with additional, new supply,” Lindsey Piegza, chief economist at Sterne, Agee & Leach, wrote in a research note. Still, a recent gauge of home builders showed that they are optimistic about the sales market for single-family homes, thanks, in part, to an improving labor market. In fact, confidence among home builders is running higher than levels historically seen for recent home-building rates. It may be that builders who survived the housing market’s meltdown feel particularly resilient. The annual pace of permits for new construction, a sign of future demand, fell 1.9% in December to 1.03 million, compared with 1.05 million in November. But the good news is that the pace of permits for single-family homes rose 4.5% to the fastest rate since January 2008. The pace of permits for apartments dropped 12.4%. Last week executives at major U.S. home builders said they are hopeful about sales given the economic factors working in their favor — pent-up demand and a strengthening labor market are expected to translate into more deals. Mortgage rates are low, and the federal government is trying to deepen the pool of applicants who can obtain loans. And as landlords crank up rents, more renting households may turn into buyers. Even so, this year will likely be another “landlord’s market,” with tenants seeing rents race higher as demand stays elevated. Eventually, an apartment glut should slow down rent growth, economists expect. With many U.S. families unable to or uninterested in buying a home, builders and investors have poured cash into constructing apartments. Economists caution not to read too much into any single home-construction report because the monthly data are subject to substantial revisions, and it can be hard to determine whether the pace of construction rose or fell from one period to the next. On Wednesday the government reported that the confidence interval for December’s total starts growth of 4.4% was plus or minus 11.7%. Shares of the SPDR S&P Homebuilders ETF XHB, -2.06% , an exchange-traded fund for home builders, were recently up about 0.6%. Over the last year, it has gained about 4%.